A fellow author that has been banging at the stall doors, waiting for their work to hit the shelves as sitting idle does not suite. Sandy Frediani, tell us about yourself and what inspired you to start writing. I began writing in 1999 when access to a keyboard unlocked the imprisoned stories within the music. By accident. I joined an online writer’s group in 1999 and in 2000 an epublisher who was also a member asked to publish my novella Emach’s Story, which is the original title of Reclamation. That epublisher ceased publishing in 2003 and closed his doors in 2006. I decided to change the title, add more to the story and am self-publishing. We have Mark R. Hunter, author of both fiction works such as Radio Red and a few non-fiction works, here with us today. Tell us, what do you do? I’m a 911 dispatcher and volunteer firefighter. I used to be a weekly newspaper writer/humor columnist, until I got downsized to monthly. Awe, dispatcher, not as easy of a job as many would have you believe. Tell us about yourself and what inspired you to start writing. I live in small-town Indiana with my wife/editor/webmaster/cover designer Emily, our cuddly but scary looking dog Baewolf (yeah, that’s the spelling), and Lucius, a cowardly ball python. I’m not sure I can say what inspired me to start writing: I was six when I dictated to my mother the story of my travels to the Land of Oz (my first fanfiction!) By the time I was twelve I was carving writing time out of my reading time, and by the time I was fourteen I knew I wanted to do it full time. Basically I just love to write stories–and have people read them. Your wife sounds a bit like me, does way to many things to be considered a sane person… just kidding, kind of. Baewolf and Lucius sound fun, scary looking dogs are the best and ball pythons are pretty cool in their own right. 😉 So, how did you go about getting published? With great difficulty. I spent many years studying the submission process and publishing industry and collecting boxes full of rejection slips. I got, and then lost, an agent. I wrote in several different genres and was a latecomer to the romance industry, after being convinced by my then-wife to try reading romantic comedies. Eventually, during a particularly hard Memorial Day weekend in which my daughter totaled my car, I got an e-mail from Whiskey Creek Press with an acceptance of “Storm Chaser”. Being on the edge of exhaustion at the time and after decades of submissions, it was a bit anti-climactic. Since then my published works have been divided pretty evenly between traditional and independent publishing–they both have their advantages and disadvantages. Awe, independent publishing isn’t surprising with a wife like Emily. What is your writing process? Do you have a time, day or place you like to write? I *like* to write at home, on my couch. I do write anywhere: During downtime at work, at the kitchen table, in my car, on picnic tables or in shelters while my wife works her saddle barn job at a state park … sometimes even in my office. When my wife was in college I found a hundred good places to write around her campus. A working writer’s gotta write! I hear you there! What do you like to do when you’re not writing? In addition to my career as a 911 dispatcher, I’m a volunteer firefighter–and by the time those two and trying to write full time are done, there’s not a lot of time for anything else. Just the same, we try to carve some time out for camping trips–and reading, naturally. We hike a lot, which the dog loves because to him it’s just a longer, more scenic walk. Dogs! I’ve been around dogs most of my life. Lately I’m spending time with horses, but only because my wife works with them. 🙂 I also like dragons, but keeping one of those as pets is murder on your home insurance. And I thought finding insurance for flying car would be hard! A stone house would definitely be a must with a dragon. So, do you have a favorite myth? I spent a lot of my reading time as a kid with the Oz books by L. Frank Baum, and it remains my favorite book series. Maybe, since they’re only 117 years old or so, those don’t count as a myth, so I may be mythtaken. Buy hey: They’ve got wizards, fairies, talking animals, even Gnomes … what’s not to myth? Marry an artist! It worked for me. Half my books were designed by the publisher’s artists, which is way easier but limits the author’s control–although I don’t have any complaints, because we’ve always worked great together. The other half were designed by my wife, who’s also a writer and has taken great pains to learn and understand the whole publishing process. If you didn’t happen to marry an artist and you’re self-publishing, then my advice is: Invest the money and hire a good artist who understands book covers. People shouldn’t judge a book by its cover, but they do anyway. That they do! As for marrying an artist, one could always just go to college for graphic design and learn to make exceptional covers there. 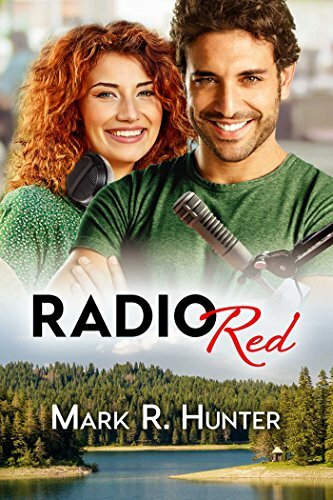 Of course, while I’m thinking about it, let’s look at your cover for Radio Red. I like it, it has a nice proportional balance to it (yeah, I might be spending too much time in design classes). So, any marketing tips you’d like to share with other authors? To steal a phrase, there are only three ways to market a book that work–but nobody knows what they are. I’ve spent considerable time marketing, and I don’t have a clue what’s working and what isn’t … I just throw a wide net and hope to catch fish. What works well for some and not for others, but either way you have to keep plugging away at it. I would advise having a blog and a website. Try to gather readers early, way before your book comes out. Appeal to similar interests–for instance, if your book is about a firefighter who solves mysteries, you’ve got an way in the door with both mystery readers in general and emergency services personnel in particular. Sound advice, yet again. Tell us about your next book project. In addition I’m working on selling a YA mystery, and polishing a science fiction that might be described as a space opera story. I wouldn’t necessarily recommend a new writer crossing genres before they get established, but I’m doing it anyway. Oh look! A book I’ve actually read (I don’t get much reading time right now). A lot of people complained about the righting style of that one. Apparently the masses don’t like screen plays, who knew? Either way, looks as though I have time for one more question, have any events coming up? I’ll be at the Avilla Freedom Festival (which, appropriately, is in Avilla, Indiana), on June 22, 23, 24, with an author’s booth. I don’t have the exact details yet, but we’ll have a canopy to protect from the inevitable Indiana scorching sun/thunderstorm. As a former resident of Indiana, good luck with the weather! Sorry we couldn’t talk more, but it’s time I ran off for class!